I’ve been in business for around 18 months and even though I see myself as quite a successful freelance writer, there has been one thing I’ve wanted to succeed in, but never even got to begin. That one thing? Connecting with people who consume my content—my blog and my podcast, that is—through an email list. I’m obsessed with connections and helping others out. I think it’s one of the main reasons I got this far in freelancing in the first place. I take great pride in creating friendships with other writers and business owners from scratch, so delaying the email marketing aspect of my business sounds ridiculous. Why would I avoid it this long? There’s a simple answer: I’m a perfectionist in recovery. I tried creating a one-page worksheet as my lead magnet, but it started turning into 10 pages and resulted in work I didn’t have time for. This scenario repeated itself two or three more times with various formats, but I always got stuck less than half way through. 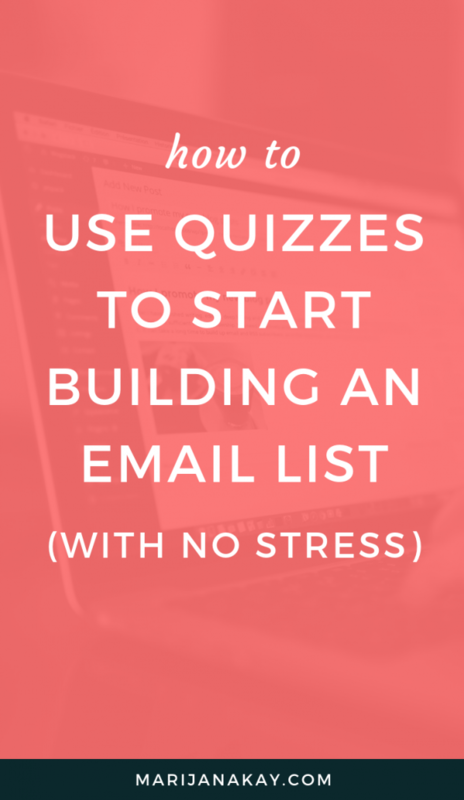 Then, earlier this year, I finally found the way to get started with my email marketing and adjust my strategy as I go: building an interactive quiz. 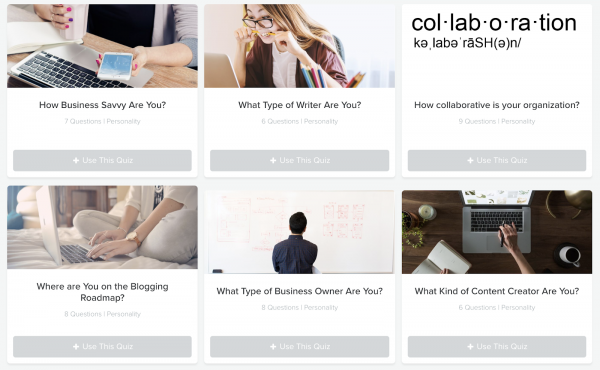 I used the Interact quiz builder to create it and I’m thrilled to review it here with you! You can check out my quiz here and check out the Interact goodness here. 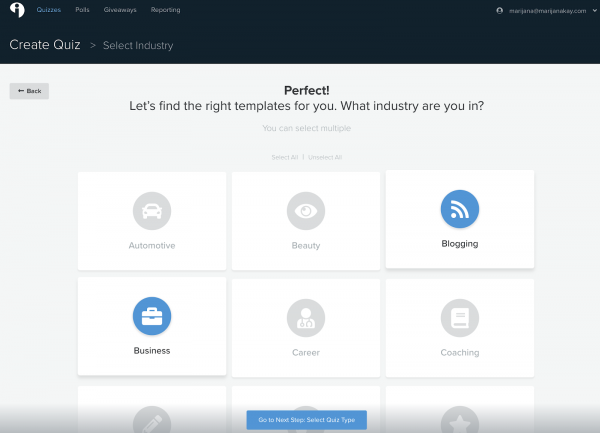 Kayla came up in my chat with Josh because we talked about building an email list with quizzes using Interact quiz builder, and Kayla is one of their best case studies. I already adored Kayla’s work, so getting to learn all this from both of them as I got to know her better is pretty awesome. As I said, putting together a lead magnet that would act as a worksheet/cheatsheet/ebook took way too much time and I was constantly obsessing over how I’ll design it, make it a fillable PDF, and all the other details that really weren’t that important for my first one. But I kept running into other people’s quizzes (one of my favorite ones to this day is the one from Kaye Putnam about brand personality—she’s another awesome person I got to meet over a podcast interview). And it felt like a great, conversational way to get started. All I really needed to do was find a way to create value for you, my audience, out of it, and turn it into questions, which felt a lot less intimidating than everything I tried up to that point. This was the tricky part. 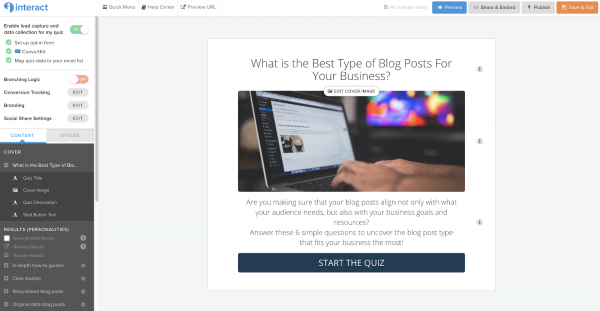 You guys are no beginners in content marketing, so I didn’t want to go with a generic style and create a quiz just for the sake of doing it (and offend you along the way). Then I remembered that there are so many companies that reach out to me for work that I’m not able to serve with my writing either because I’m fully booked or the company isn’t a fit to what I’m focusing on right now (SaaS companies in B2B, typically with at least a mid-size marketing team). 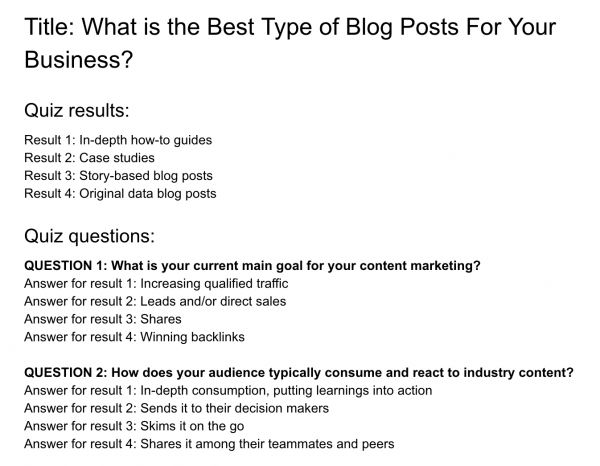 The answer was yes, and my topic was born: What is the best type of blog posts for your business? I already had some ideas on questions I’ll ask, but I decided to go with one of the Interact templates to get inspired for more. 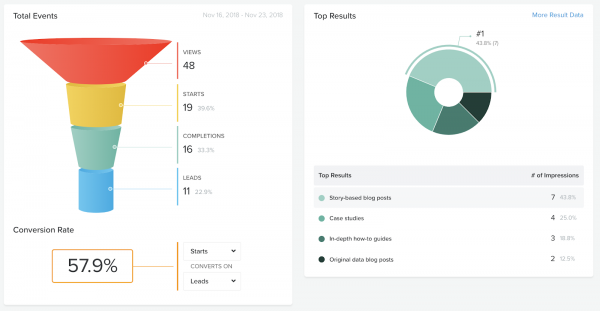 This was the definite benefit compared to going from scratch—it gave me a creative boost to add questions that were a fit with those I already had in mind, such as the one about current content marketing goals. Bonus note: These types of quizzes are also called personality quizzes because they typically follow the “What type of ____ are you?” pattern, but I flipped it around to the type of content my audience should create, which worked perfectly for me because of how much I focus on the type of writing that gets done. Once I had a general idea of the questions I wanted to include, I needed a strategy of writing all of my questions and tying them to quiz results—which is why I flipped my approach and defined my quiz results first. These made sense and weren’t difficult to come up with because these are literally the types of blog posts I consume and write all day, every day. It was just a matter of coming up with result titles that were self-explanatory and super clear. Putting questions together can feel intimidating at first, but this structure makes it easy. Once I was happy with my questions, I started taking them into Interact to see if I will have to reformat any of them to make them look better. 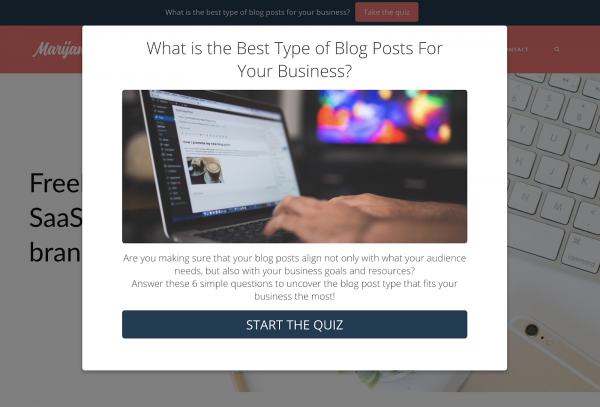 As I mentioned, each of my quiz results is a type of blog post I understand in-depth, so it was a perfect way for me to connect with you by sharing what I’ve learned so far and give you inspiration to create them yourself. 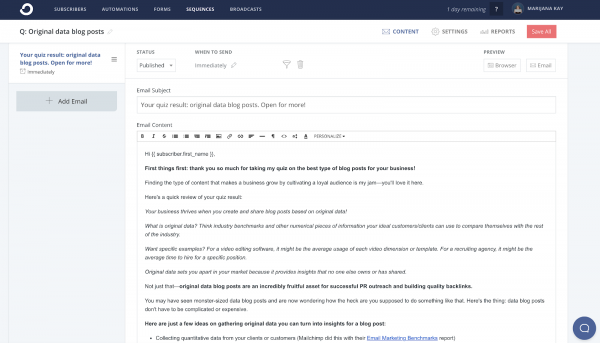 Even though there’s an option to add a call-to-action button right below each result, I kept it switched off for the moment as I’m building up my email sequences to further connect with you about a specific result you’ve received. Time for another confession: another reason why starting this took me so long is also the idea of having to master another tool—in this case, an email marketing service provider. I even intended to go with a different provider at first, but it was proving to be too much effort to figure out how to divide my sequences (i.e. my various quiz results) in an easy and clean way. 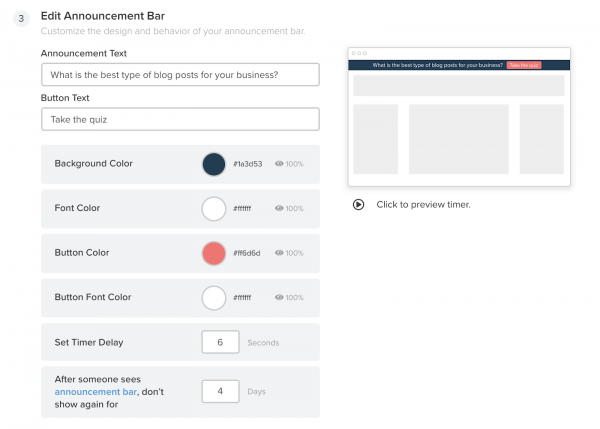 So I went for ConvertKit. I’ve literally never heard a bad word about the software and many of my online business friends swear by it, so I gave it a go… And never looked back. 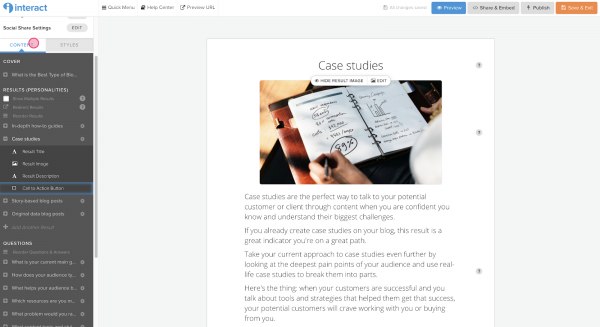 Inside ConvertKit, I simply created 4 separate sequences—one for each of my results—and saw that I can easily add relevant responses to each, and time them appropriately. So simple! Finally, it was time to make my quiz available on my website. My priority was to make the quiz available to anyone on my website without getting them to click through multiple buttons and pages, so I added an announcement bar available through Interact. I focused on making it hyper obvious what the quiz was about and fitting it into the existing color scheme of my website and brand. The integration itself was easy through the Interact WordPress plugin, which only required me to copy my Promotion ID from Interact into WordPress. Finally, I used a snippet of code to embed my quiz on a separate page so that I can promote it on social media and share it anywhere I want to! At this point, the quiz has only been live for under a week, and I’m getting new subscribers already. Running an email marketing strategy without having anyone on my list was another thing that made me anxious about putting myself out there this way! In this funnel of actions taken in my quiz, you can see that almost 58% of people that started my quiz finished it and subscribed to my emails, which is pretty dope. 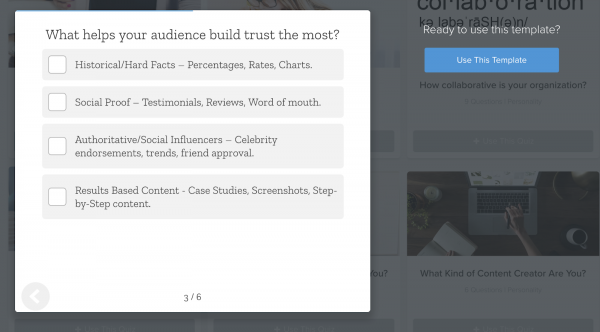 I also found it interesting to see the most frequent result—blog posts based on stories—because this indicates what it is that my quiz takers are looking to get from their content and what resources they’re ready to invest the most! I’m pumped to see how these results evolve from here. You can literally make any part of marketing feel too complicated if you overthink it. Don’t do what I did and overthink it for over a year. 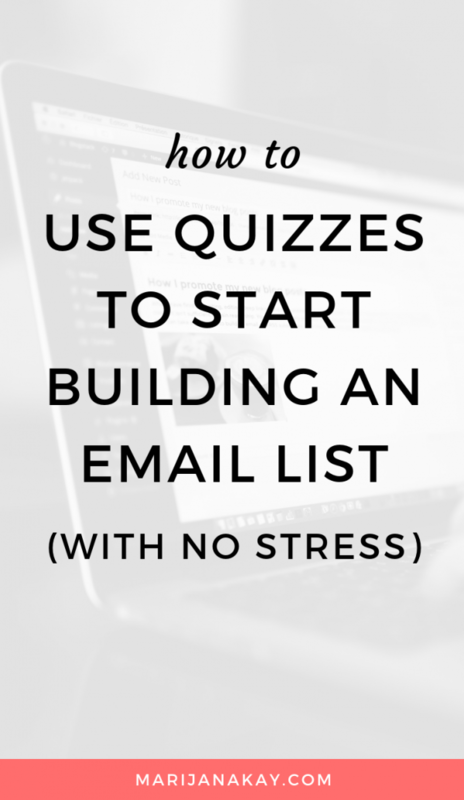 Once I decided to go with quizzes as a way to grow my email list, my biggest challenge was making it deep and advanced enough considering the level of knowledge my audience already has. Once I got started and brainstormed my quiz results, though, the questions pretty much wrote themselves, and the template I worked from gave me an awesome rush of ideas. 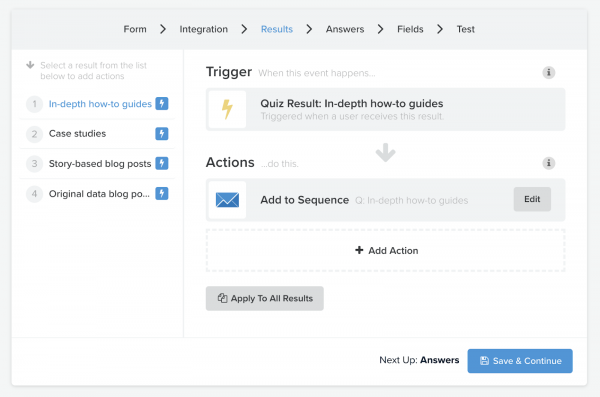 If you decide to go with a quiz as your lead magnet, give Interact a try. 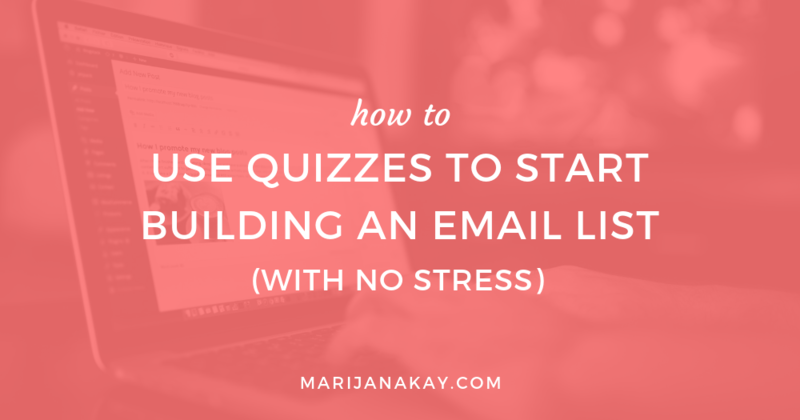 They have awesome resources to help you get started—one of my favorites is the 6-part course on launching your first quiz. It literally takes you through writing (questions + emails), styling, integration, and promotion, so there’s no room for confusion, ever. And if you have any questions about anything I mentioned in this post, make sure to reach out to me—I’m happy to share any tips to help you get started!